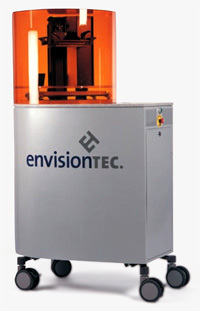 Computer-aided manufacturing (CAM) is the use of computer-based software tools that assist engineers and technicians in manufacturing or prototyping product components. CAM is a programming tool that allows the manufacturing of physical models using computer-aided design (CAD) programs. CAM creates real life versions of components designed with a software package. Because of the extremely high cost of rapid prototyping equipment and the high level of technical expertise that is required to reliably produce perfect parts, jewellers tend to use specialized third-party service bureaus. In the past jewelry design was greatly hindered by the difficult communication between the customer and the jeweler. The easiest option for executing a jewelry design was looking through a stock jewelry design catalogue. Whenever the customer had a vision or idea which was not realized in the finished piece of jewelry the sale became very time cosnuming and difficult. Since the start of computer aided design (cad) model making has taken a new direction. Jewelry stores and jewelry customers can actually see their idea before the creation stage. Other important benefits to cad jewelry design is accuracy and affordability. Your jewelry design can now be manufactured with incredible symmetry because the wax model is created using our in house rapid prototyping machines. Our systems reduce the cost and time-to-market by translating CAD Designs into hard copy 3D models. These models are so very accurate that designers can go beyond concept modeling to produce tooling grade patterns ready for casting or silicone mold-making. Together CAD/CAM allows the design of jewelry using a computer (CAD) and creates an exact hard copy model of a jewelry piece using a computer controlled manufacturing device (CAM). Our technicians use all file types compatible with any CAM device, which allows us to quickly generate a precise wax model ready for casting. Stereolithography and other hard model technologies are the future of the jewelry industry. Leading jewelers effectively use CAM "service bureaus" that specialize in prototype output. Our technicians have been in the jewelry business since 1983. They ahve been operating in various branches of the industry. We are some of the finest jewelry manufacturers and jewelers in the industry. With our fist-hand knowledge, our constant technological advances and experience throughout the jewelry manufacturing process from start to finish, we deliver quality.